Use your iPhone, iPad, or iPod to store files. Transfer documents to and from your favourite apps with iMazing. It works on Mac and PC, wirelessly or via USB. All without iCloud or iTunes. It's never been easier to add files to your iPhone and iPad. You can connect via Wi-Fi or USB cable to Mac or PC. Browse and transfer files quickly to and from any iOS device. Simultaneously send a large movie to your iPad mini and retrieve PDF documents from your new iPhone. 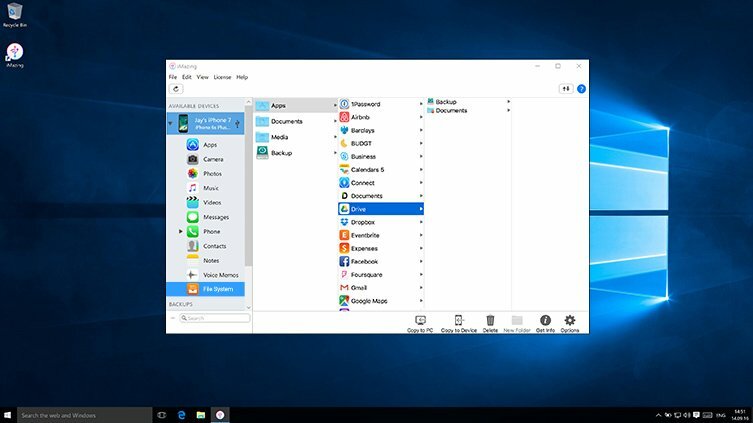 Use iMazing to browse and transfer specific files and folders from your apps. File manager apps: FileApp, GoodReader, Documents and many more. Video Players: VLC, Infuse, AVPlayer, etc. Use your iPhone, iPod or iPad as an external drive. Yes, that's possible! 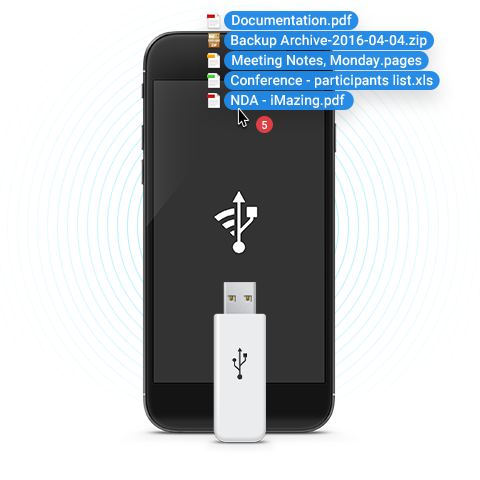 iMazing lets you access and control files directly on your Apple device. No need to go through iTunes, no iCloud, and no jailbreak required. From any Mac and PC, you can securely transfer your work files, family pictures, and music. 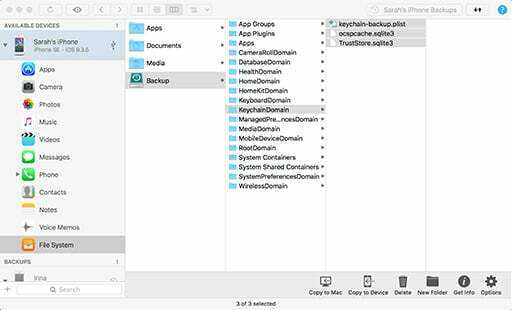 Advanced users enjoy a complete toolbox for browsing and editing iOS backups. 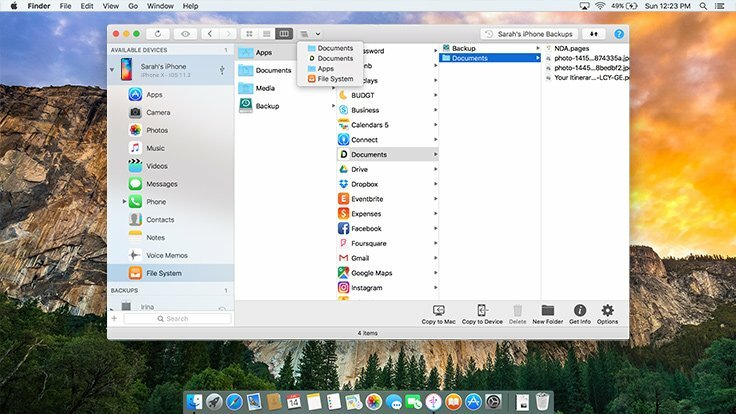 Browse and transfer files and documents between your iPhone and your computer. Powerful and user-friendly, iMazing works on Mac and Windows. Supports every iPhone, iPad & iPod. Compatible with Mac & Windows PC. I have been using this app extensively over the past few months. It has provided me with access to my phone, older iPods, my kids iPod. It works very effectively. I highly recommend it for a one stop solution for backing up and uploading files to your iDevice. Very useful app, good support. iMazing lets me browse the file structure of my iPad/iPhone (not jailbroken). Very handy, works over wifi and via USB. I use it to back up specific things that would otherwise be lost in a general back-up (Minecraft maps built with my son, for instance, no other way to do that). iMazing takes the basic connectivity between my Mac and iPhone and brings it to a level which makes computer and phone practically one unit. Moving music, messages, web pages and more room one to the other is simple and reliable. I can't think of another application I've tried which does as much as iMazing as well.